Some days things do not go as planned. My day was planned to go to my usual Dharma class. As the day progressed I was not able to attend the class. So I brought my practice back to my home. It was another good day of my own practice. I have taken the Ashtanga primary series and started to do some of the secondary series. 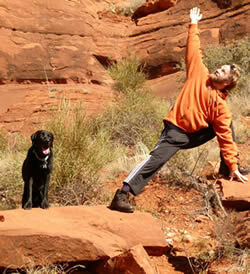 I also have added a few postures that I need to work on. 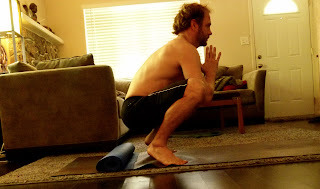 Above is the basic yoga squat. Your heels are meant to touch the ground. Mine are pretty far from the ground. I hate this posture because I am not good at it. This is a posture I often do not do. I ignore it. I would rather do things that I am good at. One of my instructors has given me a way to work on getting my heels down. I have my mat rolled up behind me in the picture. I am supposed to squat down on the mat to slowly allow my heels down to the mat. He was saying I could get my heels down if I did it every day for 6 - 8 weeks. Today I decided to take on this challenge. I will do this posture everyday, and let you know what happens. I do not want to ignore my faults. I do want to work on improving my faults. Do not ignore the little things. These are the core of yourself. I will get my heels on the floor.